Whilst we have complete confidence that you will be delighted with your custom-made joinery, we understand customers would like reassurance that, if they were to encounter problems in the future, we would undertake to put these right. For this reason we offer a company guarantee for up to 10 years on every installation. However if, through unforeseeable circumstances, we were to go out of business, this guarantee would be worthless to our customers. For this reason, we also offer additional security with an insurance backed guarantee through the CPA which means that faults that may appear after we have ceased to trade will be covered for a period of up to 10 years. Our customers are surveyed by the CPA after every installation and this information is collated into a quarterly report in order to assist us in maintaining and even improving our standards of quality and service. We recognise that choosing a contractor to undertake home improvements can be a very difficult one and many of our customers come to us by recommendation. However, in order to guarantee your peace of mind, Parsons Joinery Ltd. are members of the Consumer Protection Association (CPA) and, through this organisation, offer deposit indemnity insurance and an insurance backed guarantee free of charge on all of our installations. Regulated by the Financial Services Authority (FSA) the CPA was set up to protect the consumer by regulating and raising standards in the home improvement market. Contractors are continuously vetted for professional competence and integrity throughout their membership. It is standard practice for contractors to take a deposit at the order stage of a transaction, especially where the product being manufactured is custom-made to your requirements. 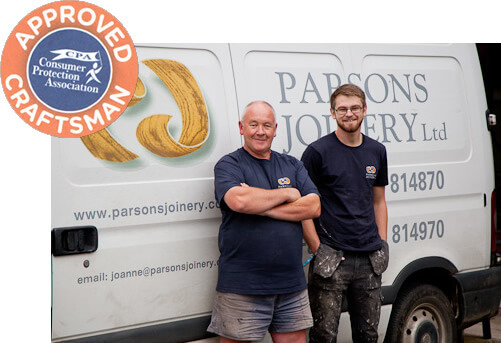 Through the CPA, Parsons Joinery offer deposit protection insurance for up to 25% of the agreed price or £7,500, whichever is the lesser. This policy covers you for a period of up to 90 days from the date you pay your deposit. If the worst happens, your deposit is either refunded to you or is completed by another company at the balance of the agreed price.